LAUNDRY ROOM || our new laundry room — MD HANEY & CO.
For Christmas, Matt gifted me with a new laundry room! He just finished it a couple of weeks ago! It may have taken a few months, but there are no complaints here because I absolutely love this little, hardworking room! 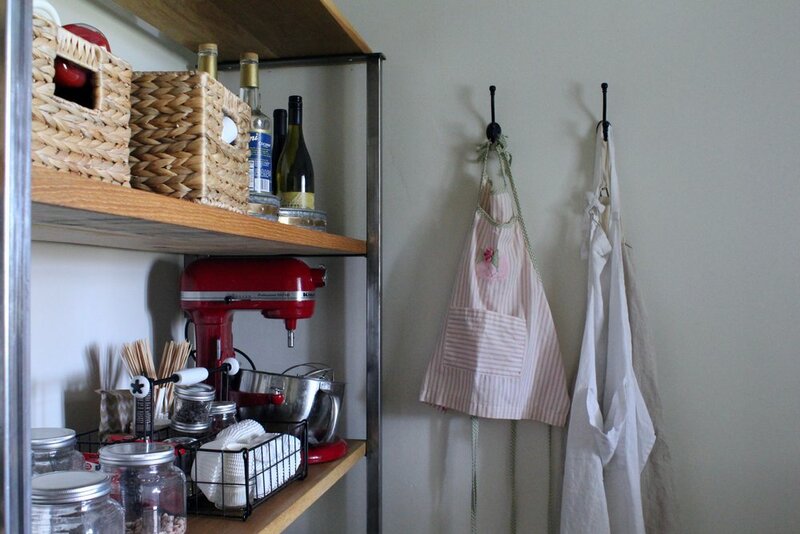 Our little laundry room is also our pantry. When we moved things out of our retail shop, we had the beautiful white oak display shelves that Matt had built. Well, we decided to use a couple of them in the laundry room! They serve as my pantry shelves. They are white oak and sealed with Miss Mustard Seed Hemp Oil. Matt welded the metal and just left the metal raw, I just love them! Matt built these beautiful countertops and cabinets with the same white oak that matches the shelves on the pantry side. 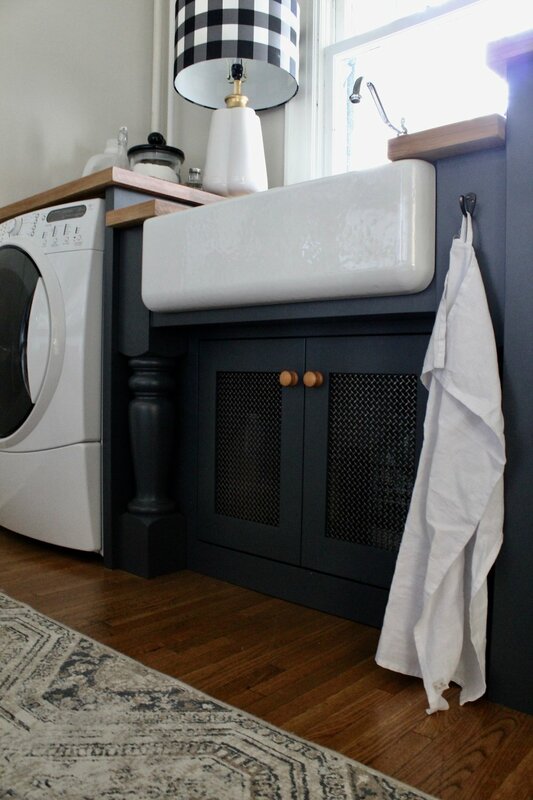 He painted the cabinets a dark navy blue, the same blue we used on one of the bathroom vanities in the modern farm house/new construction. It’s such a pretty blue, I kind of want to paint everything this color! The countertops are sealed with 3 coats of Miss Mustard Seed Hemp Oil. I love using the oil for wood countertops! They just need to be lightly sanded and re-coated to keep them looking good. It’s much easier than having the finish peel and chip where it gets wet! This seems to be the only “before” picture I can find! It’s not a true “before” since Matt had already removed the existing shelves and utility sink out of the room! Thanks for following along! We are sure loving our new/old home! Room by room we are adding our little touches and making it feel like home!